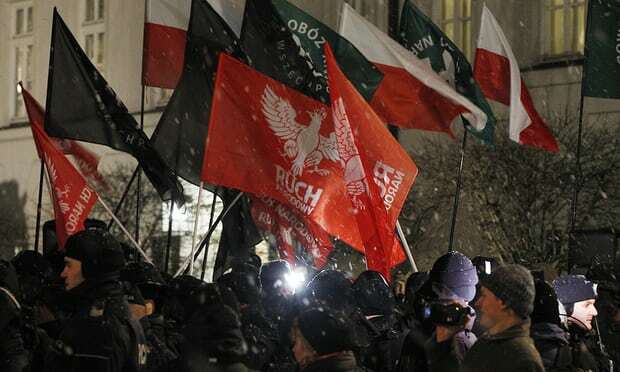 The Home Office has been urged to prevent a Polish far-right speaker from entering the UK, amid growing concern about extremist groups sending people to Britain to spread hateful views. Rafał Ziemkiewicz, a Polish author and journalist who has compared Muslims to “invaders” and “barbarians”, is due to speak at events in Bristol and Cambridge on Friday and Saturday. He has written articles stating that he sees “no hope” for France as French Muslims are waiting for “white people to get exhausted while they gradually expand their sharia enclaves … taking control over the entire country”. One of the events at which Ziemkiewicz was due to talk, in Acton, west London, on Sunday, has already been cancelled after Rupa Huq, the Labour MP for Ealing Central and Acton, was alerted to it. But Huq wants the Home Office to prevent Ziemkiewicz from entering the UK. Ziemkiewicz is not the first far-right speaker from Poland who has attempted to come to Britain to increase their following and raise funds. In February last year Jacek Międlar, a former priest, was detained at Stansted airport to prevent him from attending a far-right rally in Telford, Shropshire. He has called Jews “a cancer” and accused Muslims of running grooming gangs in the UK. Fiyaz Mughal, the founder of Faith Matters, which works to reduce extremism, said: “The big risk is clearly the targeting of local settled British communities of Polish heritage. These guys are trying to infiltrate them with far-right rhetoric. It’s extreme under Home Office definition … the comments are anti-LGBT and antisemitic. The Labour MP for Cambridge, Daniel Zeichner, expressed similar concern over the event there. He said: “Any individual or group supporting Islamophobia, antisemitism or racial discrimination is not welcome. Ziemkiewicz insisted his appearances would not be incendiary, saying: “I don’t see any reason to worry about my meetings in UK … There is nothing in my books, articles etc that would be against the law or indecent. Huq said the cancellation of Ziemkiewicz’s meeting in Acton was the second time in four months that the borough of Ealing had shown it “will not tolerate hatred and extremism from neo-Nazi speakers from Poland”. Marian Kowalski, the vice-chair of the Polish far-right political party National Movement, was unable to speak in Ealing in October after the booking at Brentside high school was revoked when the school became aware of his views. The event was moved to a Polish restaurant, Kuźnia Smaku, in South Ealing Road but the authorities prevented him from speaking there too.